Not having a 16mm projector, l took the film up to Wallace Heaton in Bond St, London, (cries of, "Those were the days" from the older members! ), where the camera had been purchased, and they ran it in their studio for me to see. They expressed an interest in it for their library, but instead I took it straight to a film distributor in Soho Sq. What a cheeky monkey! As it was near Easter they sent it to BBC TV where it was shown within a few days. Not having a TV I stood outside "a radio shop" and watched my little film on a TV in the shop window for the second time! So that was how I gave up documentary film making before ever starting, as this animation lark seemed to offer more possibilities. Look Mum, no arms or legs! But I was not able to draw too well, nor paint upon cels, so what to do now? Manipulating arms and legs and heads and all the paraphernalia which all creature models/puppets have, seemed to me something that had been done by many animators. Some new avenues must be awaiting exploration in animation. At that time, (nearly 40 years ago), amateurs were painting on film (Stuart Wynn Jones' Raving Waving etc ) and animating plasticine. What other fields were there left to explore? I decided to animate objects which didn't have any arms or legs. But how to tell a story without these appendages? Obviously, legs are not a prerequisite for movement once we enter the fantasy world of animation. In fact, they can become an obstruction to the story, the unnecessary baggage which only adds to our difficulties, and animation has difficulties aplenty without adding legs etc. to the burdens. Did you see the IAC prize winner from 2000, Der Reigen (Round Dance)? [It is in the IAC Video Library here.] The animator cut his character's arms and legs down to very simple appendages. The film was not only easier to produce in this way, but was better for it. Once upon a time ...! But how to go about storylining? In this fantasy world you have to imagine how dead objects would behave if they were alive. Are there bullies and love affairs in this world as there are in ours? Do these dead objects wish they could dance? What dance would they perform? How would they propel themselves? What drives this world of make believe? How would they like to move? My wife also took up this challenge, hence my slogan, "AnimatioN animates any mate". (Oh, isn't English a great language, in that it allows us to play with words so?) She animated coins to tell how the decimal coins swept the old coins away. Animation has so much more punch to it and more possibilities if you ensure that the soundtrack is fully integrated and synchronised into the visuals. This takes effort and time, but if one is not prepared to give this, why the heck be an animator? It means working frame by frame with both sound and visual, and there are precious few short cuts in getting those frames, one by one into the can, or I should say in this day and age, "on to the timeline". NLE and all the other software tricks available cannot help you to discover this world but they can make its frame assembly and final manipulation so very much easier than using cine film. 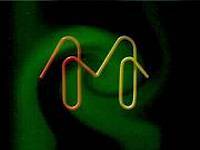 In my 2002 film, Clip Joint, many of the parameters of NLE video effects were actually animated frame by frame in addition to normal object animation on a rostrum with paper clips. Looking again at the world Children can make a world of wonderland out of simple objects. Most adults can only see these things for what they were originally made for, and nothing further. The object animator now has to relook at things previously taken for granted, and see them afresh. So is a pin only for holding a carnation in your button hole and nothing else? Not in this make believe world it isn't. A pin has a simple head, so it must have some kind of brain and so have character !! A piece of paper is only for writing on? A paper clip only for joining papers? They can hold hands! Clothes pegs only for hanging out yer pants on the line? A button is for sewing on coats? Make sure the objects accelerate correctly ...? It ain't necessarily so! In this world, the characters can flout our laws of physics. Watch the cat/mouse cartoons to see our world of physics turned on its head to wonderful creative effect, if you are not convinced. Gross exaggeration of normal movement can have enormous impact, and copying life's movements too closely can lead to uninteresting animation. Ironically, in the old days when using a film camera, it was very easy to take single frames, as nearly every film camera had a reliable single frame capture release, but with video and its tape mechanics, this is not possible. The best you will find is about 5 frames per shot. Even then the last batch of frames taken before switching off may rise to 7. So, then you have to start nit picking it over with NLE to get to single frames, or to speed it up five times ( if your NLE software allows you to do this?). What a ghastly way to do animation. You can, however, still make animated films just by using the camera alone. Just write a story where 5 frames/sec jerky animation is part of the scene .... My very first video film, Stop Press was shot in this way and the jerky paper movement suited the story. ALWAYS cut your cloth to suit the material available. From an animator's point of view, the great disadvantage with cine film is that one has no way of knowing what each frame looks like until after the film is processed, and no way of ensuring that the animation movements are progressing smoothly, except by use of projected light tracks of 35mm transparencies of the 'character tracks' required on to the set, or some form of motion markers which the camera cannot see. Even then, if an object has been moved inadvertently, one will never know with film until time and money has been spent and the ghastly errors pop up. NLE? Not on your Nellie! Now regarding some of the nitty gritty of animation in these days of NLE. Sadly, NLE software, even that costing many hundreds of pounds, has had very little thought given to animation. Maybe NLE software writers are all documentary makers. For those using Premiere, it is possible to capture single frames, although the DV500 plus card doesn't directly allow this. Ridiculous, that you have to use pricey Premiere with a cheap card to capture a single frame! I see that Pinnacle are launching Studio Deluxe card/software. But will it be able to capture single frames easily? Who knows? None of the reviewers in the magazines ever mention animation possibilities in their reviews. The solution for serious animation I have found is to ignore completely NLE! Later, NLE can then be used to assemble frames after capture, to sync with the soundtrack(s), and to add any special effects you require. I use a separate folder for every small sequence of animation, as each animation session is best given its own name and kept in its appropriate file. As an hour's work may only produce a dozen(?) frames or so, even for only a one minute film, there will be 60 odd files to organise for later use. Don't cry - get onionskinning! If NLE packages are so restrictive for animation, what software can be used? Stop Motion Animator a little freebie downloadable from USA is a useful package of free software, which I found on the web. Trouble is, I cannot get it to show live images on my own PC, although I did contact the writer without success, but you may be luckier. As it's free you have nothing to lose, except your patience! 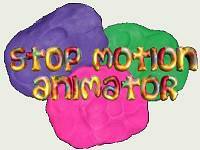 The particular animation software I use is Australian (Stop Motion Pro. listed at £46.99 on amazon.co.uk October 2011) and this captures uncompressed. This is another reason to keep the files short, as loading back into the animation program uncompressed files for future additional animation is unnecessarily time consuming. So why is it really preferable to use this special software for animation? Apart from it being easy to capture single frames, more importantly it enables one to Onionskin and also Rotoscope from live action footage too, thereby overcoming the great disadvantages that the film camera, or NLE software used with a video camera have. The term 'Onionskinning' refers to the ability to see ghosted upon a VDU screen the last frame already taken by the animation video camera together with the current picture as seen by the camera. This ghosting can be adjusted in its intensity to suit the lighting conditions, from nil ghost (just the picture the camera is outputting) to 100% ghost (no camera output seen, just the previously taken frame). ..."You've never had it so good!" In step 1 we are going to animate the ball towards the square (this is a simple representation of any two objects we may be working with). In step 2 we have moved the ball - but in doing so we have inadvertently slightly knocked the square (or the grandchild/cat/dog barged in and did the job for you!). This may only be a small amount and maybe one wouldn't notice this and would continue with the animation. Even if you did spot it, (as your heart went into your mouth), you may not know exactly where the square was before you moved it! If this were film, this error would not show up until the film was processed. Even with a video camera capturing to NLE it wouldn't be noticed UNLESS you ran your animation on the timeline. Very bothersome to have to do this every 2 or 3 frames you take, just to check for errors, which would be very difficult to correct, anyway. Now we come to the magic ... step 3 shows what you would see on your VDU if you were using Onionskinning. Here the slightest movement of the square is very obvious as it is ghosted onto the picture. (The square out of position is shown grey in my diagram, but actually it will be the square in its proper colours.) You can now gently nudge the square back into its correct original position, until the grey outline disappears. Hey Presto, your mistake has been rectified. lf you are animating by object replacement, you will see how very useful Onionskinning can be. For now you have deliberately removed an object from the set and wish to replace it, (altered in some way), and possibly in exactly the same set position as before. Onionskinning shows you exactly where it was and how it appeared BEFORE you removed it. One good trick if you have moved incorrectly and used onionskinning to help correct, is to insert a quick dissolve at this juncture (added later on the NLE timeline) if the action allows this, from the previous frame to the next, each frame being extended (easy with NLE) to encompass the length of the dissolve. This helps 'soften' your error, even if the now correctly placed object is still just a tiny, tiny bit out of place after correction. The human eye is very sensitive to slight-sudden movement and tiny errors can be amazingly conspicuous and take the audience's mind right off the action, so a fast dissolve is less noticeable than a jump cut, especially if action elsewhere can help take the eye away from the error area. You may have seen interviews on TV where quick dissolves are used on the speaker to cover up time lapses in the interview ..... maybe he wished to be excused at one point if the interviewer was too pressing! More scope with rotoscoping . Rotoscoping takes onionskinning a stage further and allows one to ghost upon the live shot, any frame or sequence already 'in the can'. This allows preplanning of animation by use of guidance drawings and tracks etc which at a later date can easily be ghosted over the screen when shooting. One can also onionskin the previous frame taken too for error checking of course. In the diagram, the tracks of a square and sphere to be animated to hit at the 'FINISH', can be drawn, filmed and later rotoscoped onto the camera view. This allows control of the objects movements so that they both travel and arrive as you require (after 12 movements in this simple example). Rotoscoping software is also used by cel animators to achieve more natural movement, but how awful, Tom and Jerry would be if they only moved the same way as real cats and dogs! A person say, is filmed walking as a sequence of frames, then these are used in rotoscope to onionskin each frame in turn upon the camera shot. In so doing one can draw/move the characters to match the rotoscoped frames. Each time a frame is taken the rotoscope will automatically onionskin the next frame in sequence upon the live camera image, ready to line up and take the next frame, and so on. The end effect of all this is a character walking exactly as we do, but exact copies of natural movement seem to me to defeat the object of animation's special quality. However, Onionskinning and Rotoscoping are extremely useful tools for the animator, assisting in error detection and correction, and allowing small objects to be moved with a greater precision than was hitherto possible. Some of this special software also allows playback of your work in progress, thus saving exporting to NLE to see how your animation looks in real time. For those interested in any branch of animation, there are web sites aplenty, which will serve your every need, even including its full history. See the stars of Albert's hit film Clip Joint here. A final plug for the IAC Video Library ... two programmes of over 50 minutes have been prepared by Albert illustrating these and many other of his techniques introduced by the man himself and packed with illustrative clips. They make a great club evening ... details of the video here. This article first appeared in Film & Video Maker.